This isn’t the first time T-Mobile and Nokia run a free Xpress-On back cover promotion like this. The last promotion for free The Dark Knight Rises back covers ended just recently on March 31st. No need to complain if you missed out however, because now the promotion is back until July 31, 2012. 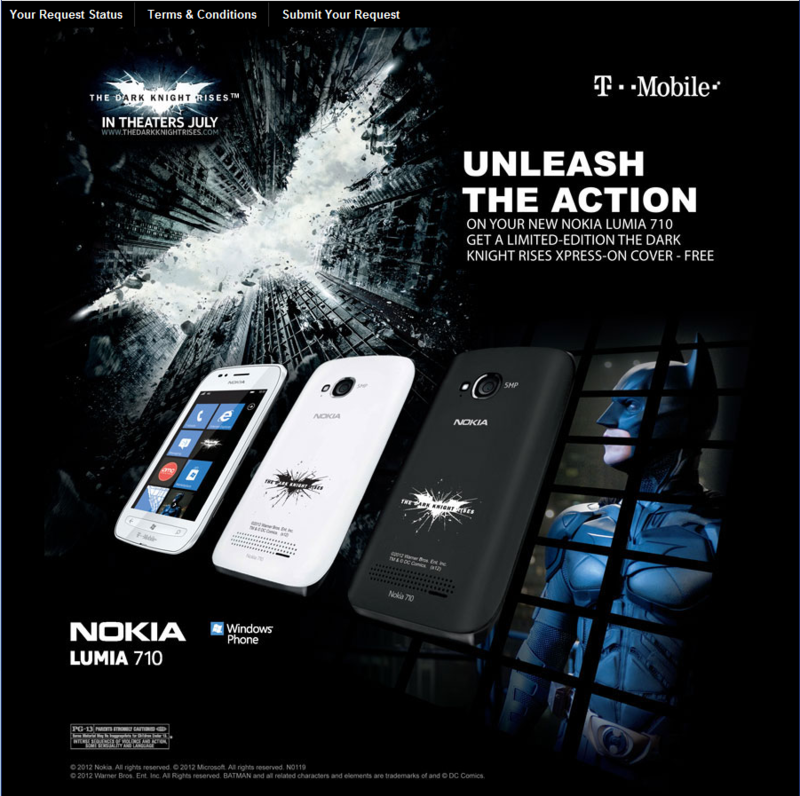 If you purchased a Nokia Lumia 710 Windows Phone through T-Mobile in the United States, you are eligible to receive a free The Dark Knight Rises Xpress-On back cover. You are eligible for one single back cover, available in white, cyan, yellow, black, and magenta colors. The promotion is available now through July 31st. According to the post over on the Nokia Conversations blog, the covers are only limited by the duration of the promotion, so it seems the covers are essentially special order. Running through July 31, those who are purchasing a Lumia 710, can pick up their cover for free when you purchase the phone at a T-Mobile store. Have you already purchased your Lumia 710? No problem – simply go to our cover giveaway page and fill out the form. Don’t forget to specify which color you want and we’ll gladly ship it to you. Visit the Nokia/T-Mobile page for this promotion to request your free Xpress-On The Dark Knight Rises back cover. This promotion only applies for purchases through T-Mobile, if you did purchase through T-Mobile then by all means it wouldn’t hurt to try and request a cover anyway.